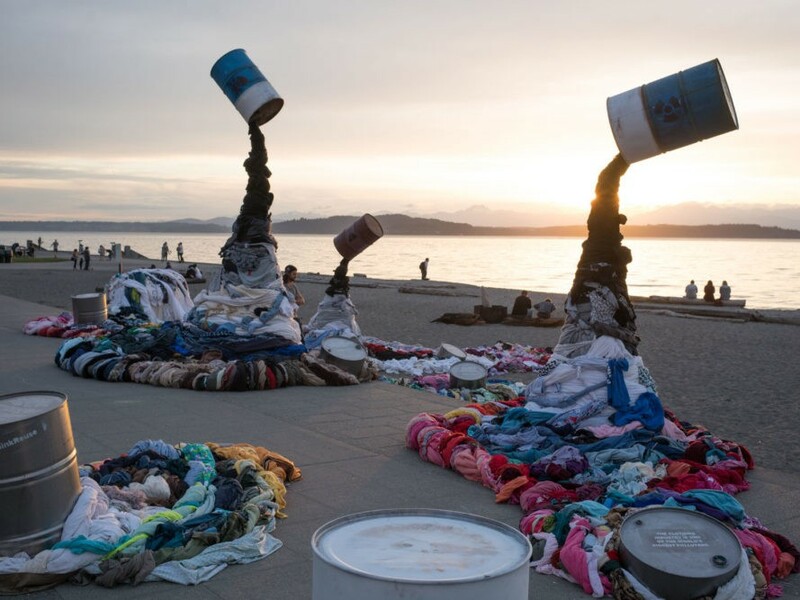 A larger-than-life "clothing spill" at Seattle's Alki Beach today presents a striking reminder that landfills shouldn't be laundry piles. Staged by Savers, an international chain of for-profit thrift stores, the installation is a poignant illustration of the prodigious amount of textiles Americans throw away every year. "North Americans send over 10.5 million tons of clothing to landfills every year, 95 percent of which could have been reused or recycled," Tony Shumpert, vice president of recycling and reuse at Savers, said, before adding that consumers worldwide will buy around 80 billion pieces of new clothing this year alone. "We think that’s a serious wardrobe malfunction." Together with its nonprofit partners, Savers diverts more than 650 million pounds of reusable goods from North American landfills each year, according to the company, which employs 22,000 workers and operates more than 330 stores, including Value Village and Unique in the United States and Canada, Village des Valeurs in Quebec, and Savers Australia. Still, Shumpert says the world can—and should—do better, and not just on Earth Day. Eric Stubin, president of Secondary Materials and Recycle Textiles Association, agrees with that sentiment. Watch the video below to see how the installation came together. In the case of clothing ending up in landfills, it is estimated that 40%-50% of that landfill waste actually comes directly from thrift stores (Goodwill, Salvation Army, etc), and not directly from people. It's a hush-hush business practice wherein clothing items that have been donated to these stores are only kept as inventory for 90 days. After 90 days, if the item has not sold, it is placed on sale for a week, then shredded (so people will not "steal" the items) and dumped into dumpsters, rather than simply donate these items to shelters. So, while this is certainly a powerful image, it's not revealing the entire truth behind those businesses whose choices are less than beneficial. Together with its nonprofit partners, Savers diverts more than 650 million pounds of reusable goods from North American landfills each year, according to the company. Savers employs 22,000 workers and operates more than 330 stores, including Value Village and Unique in the United States and Canada, Village des Valeurs in Quebec, and Savers Australia. Still, Shumpert says the world can—and should—do better. "We hope consumers will rethink reuse," he said, "which includes shopping thrift, donating unwanted goods, and consuming in a more responsible way." 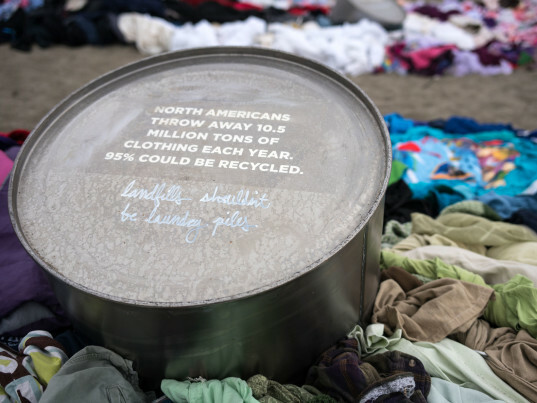 "Eighty-five percent of clothing waste ends up in landfills, with only 15 percent being reused or recycled," he said. "We applaud Savers for calling attention to the issue of clothing waste."